It used to be so easy feeding your child. You just gave your baby a bottle or your breast and they were happy. But things have changed. Suddenly your easy to please baby has turned into a fussy eater. It seems as though nothing you put in front of them meets their standards, even if it did yesterday. The fact is, toddlers can be picky eaters. While it is easy to assume that your toddler’s refusal to eat broccoli stems from a deep hatred for all things green and healthy, there’s a very good chance that this is not the case. Two of the main reasons children tend to be picky in their food choices are fear of new foods and trying to assert some independence. Understanding these two factors is important to helping your child overcome their fussiness (or, at the very least, helping you feel more assured about the normalcy of being a picky eater). It’s mealtime and your toddler looks down at their plate to see a strange white thing sitting there. This white thing has never appeared on their plate until now and they’ve never noticed anyone eating this white thing before. This means that they will also not eat it. It’s strange. It’s unknown. It’s weird. "But its just cauliflower!" you’re thinking. To your toddler it’s still very strange. Often, toddlers need to see food a number of times before they can think of it as a regular part of their diet. For some kids, this means seeing the questionable item two or three times before they try it. For others, it means a regular nightly appearance for two weeks before that odd food ventures anywhere near their mouth. One way of helping your toddler change their classification of the food from "strange" to "acceptable" is to eat it yourself. Since children learn best by example, seeing you or someone else in the family eating a particular food helps your child’s willingness to expand their palate sooner. Perhaps the food is not new to your child. In fact, they were just eating (and loving) that broccoli yesterday but today they absolutely refuse with the justification that they hate it. Frustrating? Yes, but there’s no reason that your toddler needs to know that. Many times, toddlers say ‘no’ as a way to assert their independence from their parents. When it comes to mealtime, toddlers hardly ever have any say as to what they get to eat –unless they refuse to eat an item. By saying no, your toddler is able to take control over some part of his life. While 18 months may seem too young for a child to claim independence, just think of this time as training for when they are teenagers and will ignore everything you say to them. Many parents choose to combat their child’s struggle for freedom with tyranny. Forcing your child to finish everything on their plate or risk being punished ("No dessert if your don’t finish that lentil soup!") is often not the best solution to the problem. Not only can this backfire by making your child even more stubborn in their refusal to eat, it can also lead to problems with food later on, such as obesity or eating disorders (if you are worried that your child may have an eating disorder, visit our forum to chat with other parents in the same situation). One of the main reasons parents become concerned over their little picky eaters is because they are worried that their toddler is not receiving the appropriate amount of nutrients. Before you become too overly concerned with this issue, take a moment to look at the bigger picture. 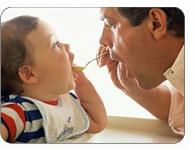 It is very unlikely that every single meal your toddler eats will pack all the nutrients your child needs. However, over the course of the day, most children consume enough of everything to get the vitamins that they need for healthy growth. Even if your child chooses to eat just peanut butter sandwiches for three days straight, there is still no cause for alarm just yet. Just like adults, a toddler’s body knows what nutrients it needs. Over the course of a week, your toddler probably takes in all the vitamins and minerals necessary for good development. If you are concerned, then keep a food diary for a week or two. You might be surprised at how little it takes for a toddler to receive the appropriate nutrients. Also, remember that a serving for a child is only about a quarter to half the size of an adult serving. One slice of bread is equal to two grain servings for your toddler. To learn more about food requirements, take a look at the nutritional guidelines for toddlers. If you are still unconvinced that your child is receiving enough nutrition, then make an appointment with her or his health care provider to discuss the situation. So, how do you make toddler food easier for the picky eater? Look to make the meal more toddler friendly. First, keep the serving sizes small. Too much food can overwhelm a child and can possibly lead to over eating which may cause problems later on. Additionally, it is important to remember to feed your children when they are hungry and to listen when they say they are full. Again, ignoring them when they say ‘enough’ can lead to food issues later on in life. To help your child feel more in control of her or his food choices, then present them with a few options at meal time and let them decide what they would like to eat. Asking your child what she wants to eat may seem like a good idea since she can assert her independence this way. However, it can often result in her eating the same item over and over. So, if you’re worried about your toddler’s nutrition, avoid asking him what he wants. Instead, put a few items onto the table, at least one of which you know they like and maybe one or two new items. And whatever he chooses, do not make a big deal about it. Even if you don’t agree with the choice, you need to allow your toddler the right to decide what he would like to eat. Also, keep in mind that your child can only eat what you give him. If your toddler’s diet is full of healthy meal choices, then there is little chance that he will not receive the appropriate nutrition. Presentation of food can also make a big difference with toddlers. Try making a sandwich more exciting by cutting it into a different shape. Serve applesauce with raisins in it and tell your little one the raisins are ants (this trick may not work with all toddlers, so use it with discretion). Sprinkling a light amount of icing sugar or cake-sprinkles on berries will downplay their healthy factor. Foods that children can get their hands on are always a hit with toddlers. Some great "hands-on" toddler menus include tacos, fajitas, wraps, and pizzas where they can choose their own toppings. This is also a great way to introduce new items without them seeming so scary. With a little creativity, toddler meals can easily be tailored to suit the fussy eaters in your household. And don’t worry, they will out grow this phase soon enough.